Eating Healthy on a Budget - and be skinny too! Eating healthy on a budget is possible especially when you eat low glycemic foods. In fact, it's much easier to eat cheaply on the low glycemic plan. That's because eating foods in their natural state is the cheapest way to buy them. There's no expensive packaging or extra expense of the processing. When we take the time to cook ourselves we save a pile of money and it also happens to be the healthiest way to eat! Eat meat only 2 or 3 times a week and you will save a lot of money and you will be eating less saturated fat. Buy food in it's natural state and give yourself time to cook it. All that packaging and extra processing costs more. Eat food in season, buy in bulk. Plan your shopping and meals, make a list, before you food shop. This is a low glycemic food list of mostly super foods that also happen to be quite inexpensive. These are the ones that give you the most bang for your nutritional buck and do NOT raise your blood sugar. You don't have to spend a lot of money to eat in a healthy way. What you do need to do is be willing to take a little more time to figure out how to cook these cheap, healthy foods. People assume that cooking legumes (beans) and grains is time consuming and complicated but it's really not. What is necessary is a good simple recipe and some planning and some cooking pots with good lids. Here it is, your primer on how to cook beans! It's great to buy them in cans because it's so convenient when you're in a rush but they really don't take so much time if you plan ahead. People joke about eating beans when you need to be frugal but the truth is beans are super foods! Eating healthy on a budget means you are eating like a king. Eating low glycemically is all about controlling your blood sugar. Guess what super food helps you to control your blood sugar? Eating as little as 1/2 cup of beans a day has been shown to greatly improve your ability to control your blood sugar. Not to mention they keep your cholesterol low. This is why you will find a lot of bean recipes on this site. They are the power food for people wanting to lose fat for a lifetime AND never get type 2 diabetes or any of the other sugar eating diseases. Beans are extremely high in fiber and a great source of minerals especially iron and potassium, antioxidants and lots of the B vitamins. They are high in soluble and insoluble fiber. The trick to falling in love with beans is buying them whole in bulk, not in a can and cooking them yourself. On the other hand, when you are short on time nothing is more convenient than having a can of beans on hand! They are super delicious when you cook the dry beans and add just olive oil or a dollop of sour cream and some seasonings. Yum. There are two reasons people don’t do it – flatulence and they think it’s too time consuming. There are solutions to these two issues! Eating healthy on a budget means eating lots of beans and cooking them yourself and here’s how to avoid flatulence. Beans are super foods and instead of eating them once in a blue moon it’s far better for you to eat them all the time but in small amounts. 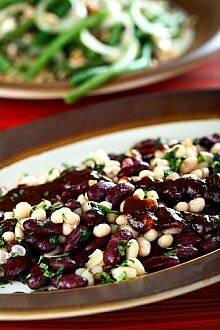 You will be eating healthy on a budget with beans. Cook up a bunch on the weekend and then have them in the refrigerator to add to a soup. Add them to your chili, to a salad, as a side dish for eggs, meat, or vegetables. A small pile of beans (one cup of cooked beans is a serving) sautéed in garlic and oil with salt and pepper and a green salad with grated cheese is a great meal and what did that cost? Practically nothing and it’s low glycemic, super nutritious, high in fiber and supplies a lot of nutrients. Finish your meal with fruit and yogurt. That is eating healthy on a budget for the foodie. So eating healthy on a budget means getting up close and friendly with beans and what else? 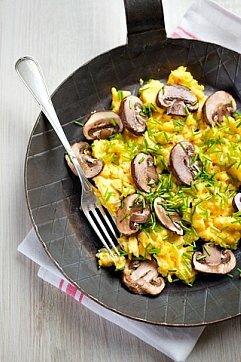 How about eggs for your protein? Eggs have provided us with a high quality protein for thousands of years and they contain almost all nutrients especially fat soluble vitamins A and D.
It's true that eggs are high in cholesterol, 180 mg. for a medium egg and the American Heart Association recommends that you eat only 300 mg. a day. However, eggs contain only 2 grams of saturated fat and 3 grams of unsaturated fats (mono and polyunsaturated.) Free range chicken eggs have many more essential fatty acids. In fact, look for these eggs or buy them directly from a farmer because getting more omega 3s in your diet is worth the effort. Get the pasture fed or cage free chicken eggs if you can find them. It's worth paying a little extra because eggs are super cheap to begin with and they are a super protein source. They will be much more nutritious if the chickens have been out in the grass eating bugs. The two super cheap and great tasting grains to eat that are low glycemic are barley and bulgur. These need to be your staple grains because they are the ones that will keep your blood sugar stabilized. 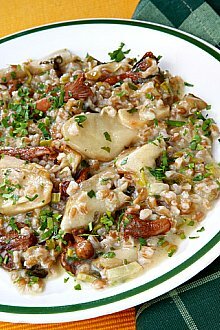 Pictured to your left is a mushroom, barley, onion stew - delicious and easy to make! These are cheap, healthy foods that can be bought in bulk. Remember the more you buy out of a bin the less you pay for all that expensive packaging. Barley packs a nutrient punch. Chromium is a mineral that keeps your blood sugar low and there is a lot of chromium in barley. You can add barley to soups, breads and casseroles. It has B vitamins, iron, copper, magnesium and phosphorus. Bulgur is cracked wheat and a staple of Middle eastern cuisine. It is used to make tabouli which makes a cold grain salad and to put in soups and casseroles. It is traditionally made from sprouted grain which is far more digestible and delicious than processed wheat. In order to be eating healthy on a budget it helps to get acquainted with the low glycemic whole grains. Bulgur is extremely high in fiber and can prevent constipation, colon and breast cancers, and reduce the risk of diabetes and heart disease. It is extremely rich in minerals and contains manganese, selenium, magnesium. It's super easy to prepare because it doesn’t even require cooking! Soak it and make a salad. If you've never tried bulgur you don't know what you're missing. When you’re eating healthy on a budget don’t forget the oats! They will also help you manage your blood sugar. Try my low glycemic oatmeal recipe and start out your morning with a breakfast that will sustain you at your optimum level until snack or lunch. In a study by the New York Obesity Research Center at St. Luke’s-Roosevelt Hospital in New York City, 60 people who ate oatmeal for breakfast had 30% fewer calories at lunch. The soluble fiber in oats creates a feeling of fullness. Oats are cheap when you buy whole, rolled oats. They only take 10 minutes to cook. Quinoa is a grain that comes from South America, specifically Peru, Ecuador and Bolivia. It is unusually high in protein, 20%, making it low glycemic and highly nutritious. It contains the amino acids that tend to be low in other grains making it the ideal grain for vegans and those needing to manage their blood sugar which means practically all of us. It contains iron, calcium, phosporus, B vitamins E and fat. I already have one quinoa recipe on this site which is a risotto I call Quinotto. It is cooked like rice, 2 cups of water to 1 cup of quinoa but the taste is enhanced if you toast the quinoa seeds in a dry skillet about 5 minutes before cooking with water. One of the cheapest strategies for eating healthy on a budget is eating local food that is in season. This way you eliminate all the costs of shipping to your corner of the world. Oranges in winter, apples in the fall, stone fruit in summer... this is the way we used to eat before we got spoiled eating bananas all year around shipped in from South America. Not everyone lives where fresh produce is available, much less locally produced fruits and vegetables. If that's the case for you buy frozen fruits and vegetables and canned fish, beans. Eat canned fruit only if you can find it packed in water. Usually it's possible to buy frozen spinach and water packed peaches which are cheap, nutritious and low glycemic. Yes, yes, I know you are saying what about the exotic grains like quinoa from South America? It comes from a continent away. You’re right of course. If you can buy locally grown whole grains by all means do that. In the meantime, know the ideal and do what’s possible. And quinoa happens to be a high protein, low glycemic, delicious grain. Some ideas for fresh dark leafy greens are kale, Swiss chard, spinach and dark salad greens. Make salads and add them to soups, spaghetti, bean dishes and eggs. You will be preventing nasty diseases and stabilizing your blood sugar. Since frozen foods are just as nutritious as fresh ones include them even if you can get fresh produce if you can get them cheaper. Walnuts may not seem to be the cheapest food around but considering how nutrient rich they are and how they compare to meat as a protein source, they really are a cheap healthy food. One serving of walnuts is 7 walnuts. A half pound of walnuts gives you a lot of servings for around $3.50. You need an omega 3 food to round out the "eating healthy on a budget" plan. Walnuts are a protein source with unsaturated fats. Walnuts are truly a super food - one serving is very filling and makes a great snack. They are brain food and contain loads of vitamins, phenolic acids, tannins and flavonoids as well as the omega 3 fatty acids. They support heart health, prevent cancer, fight diabetes, improve cognitive function and they may even help you sleep better. They contain more antioxidants and nutrients than any other nut. There you have it. This is a lot of cheap, healthy food for eating healthy on a budget. Low glycemic food, food that doesn't raise your blood sugar is real food in it's natural state. When you eat real food you are getting volume and water so it is far more filling than the sports bars and other high carbohydrate "fast food snacks." The high glycemic granola bars and other so called " healthy snacks" are expensive and often just give you sugar cravings and very little food. Before you shop, plan your recipes for the week and make a list of all the foods and seasonings you need. Make a pot of beans on the weekend and use them all week. Shop at the discount groceries first and look for sales. Many of them even have organic sections now. Combine your grains with salads and vegetables and eat fruit for dessert. Now onto some cheap, healthy, low glycemic recipes to help you promote and support a lifetime of fat loss and your optimum health! You want to eat high fiber beans more often but you don't know how to cook them and you get gas? We tell you about a dozen different beans and how to cook them and tips for digesting them too! Return from Eating Healthy on a Budget to Lifetime Fat Loss home page.